It's not easy to cramp 60 years of MAD content into a 256-page book. This is a good effort. 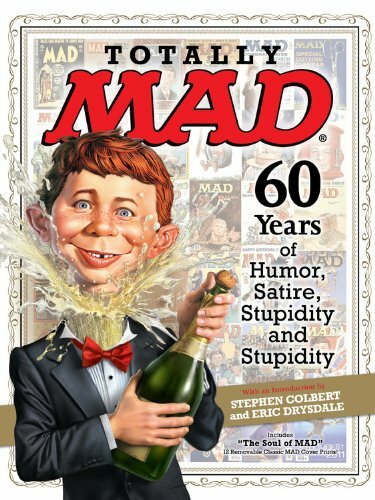 Totally MAD features selected gags that were previously published. This includes spoofs of almost everything from ads, comics, TV shows, movies, to current affairs. My favourites are the movie spoofs. Not all jokes are a hit but the better ones are in the book after filtering. You've got to admired the ingenuity and bravado of MADness. It seems like there's nothing they cannot or don't dare to do — a middle finger for a cover art, anyone? The several essays talk about Bill Gaines, Alfred E. Neuman and other oddities. Those are really inspiring to read if only to find out more about how they got into trouble. I wished there were commentary from the artists though, which would have made the book even better. A nice touch is the inclusion of 12 cover prints on high quality art paper. My only complaint is on the size of the reprinted pages. Many two-page spreads are featured in a single page of this book. The original pages are about a quarter the size now. It's not easy to read the small text. The reproduced covers that run at the bottom of some pages are a bit small too. It's still a great book for MAD fans. If you're not into MAD, you can treat this as a standalone joke book.